Do I need a septic system? Septic systems are used in areas where a community sewage system is not available. Check with your local authorities to find out if you have a sewer in your area. If not, you’ll need a septic system. Unless, that is, you’re content with an outhouse. What types of septic systems are there? The modern septic system has come a long way from a ditch and a pipe. We can install everything from basic septic tank and drainfield septic systems to the most advanced pre-treatment alternative septic systems. 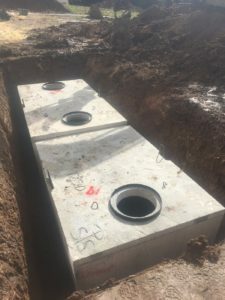 Here is a partial list of some of the septic systems we can install with links so you can learn more about them. Here is some other good information about septic systems. Washington On-Site Sewage Association (WOSSA). National On-site Wastewater Recycling Association (NOWRA). U.S. Environmental Protection Agency (EPA):On-Site Decentralized Wastewater Treatment Systems . Clark, Washington’s on site septic system information . Cowlitz County on site sewage system information . Almost one quarter of the homes in the United States utilize on-site septic systems (OSS) to dispose of wastewater. In Clark County, septic systems make up the majority of the sewage disposal systems in rural, un-sewered areas. Septic systems, unlike public sewer systems, require regular maintenance and inspection in order to remain working properly. Septic systems are made up of two main components: the septic tank and the drainfield. These two separate parts work together to dispose of waste and filter wastewater. The septic tank removes solids to prevent clogging the drainfield, and stores up to half of these solids in the bottom of the tank. The drainfield further treats the waste and spreads it out to allow it to decompose and filter through the soil, removing contaminants. If you own an on-site septic system, you are responsible for properly monitoring and maintaining the system. This reduces the risk of problems or system failure. Have your septic tank pumped regularly. Keep records of all septic system maintenance and repair. Learn the location of your septic system and drain-field. Keep this information with your maintenance records. If you experience problems with your septic system, contact a professional. Divert other sources of water away from system. Don’t dispose of non-biodegradable trash in your septic system. Test pits (commonly called perc holes) are needed to determine what type of soils are at your property and to determine the depth to the restrictive layer. We do not provide the soils analysis aka “perc testing”, but we can refer you to several good septic system designers who provide this service if you contact us! What’s wrong with my septic system? There are many things that can go wrong with a septic system. If you have a problem, take a look at our Frequently Asked Questions page. What if I currently have a septic system and want to convert to a city or county sewer? We can do septic-to-sewer conversions. Take a look at our septic to sewer conversions page. Can you recommend a good septic system designer, pumper, or inspector? You bet we can! We’ve been working in the industry for 19 years, and have experience with many of the best septic designers in the area. Check out the lists below.